Since the opening of the Shake Shack in Philly I’ve heard great things about their gluten-free menu and was quite eager to try a grilled hot dog or burger. That chance came one Friday night as I ventured into the city to sit (or stand as it can be a bit crowded still), and test the place out. The wait went fairly quickly for an 8:30pm arrival time, and though the menu is small I couldn’t decide between the Shack Burger and the Shack-cago hot dog. Such problems! I chose the Shack-cago hot dog, which included all the flavorful toppings a hot dog should have: ketchup, mustard, relish, pickles, peppers, onions, and lettuce. I brought my own hot dog bun so that I could truly enjoy the dining experience. Some may argue this is an inconvenience, but living gluten-free you learn to be flexible, and I’m OK with doing a little pre-planning. Over time I would like to think they will offer a gluten-free hamburger or hot dog bun so you won’t have to carry a gluten-free roll in your purse. 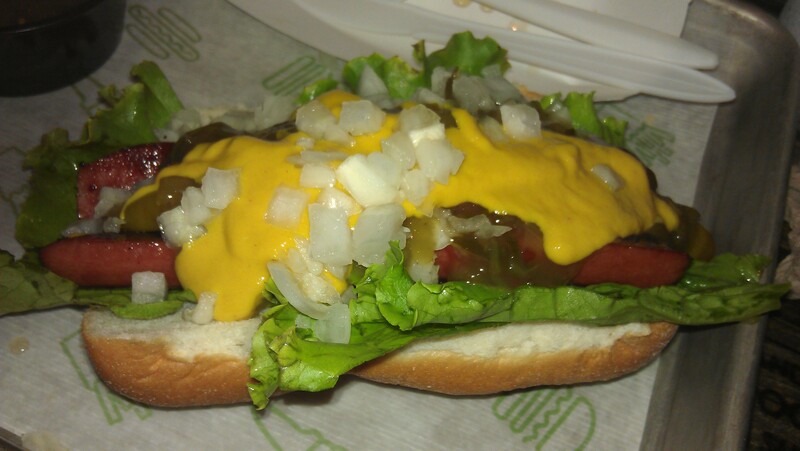 While I could have used more pickles, the hot dog was cooked oh so well. I love having the grill marks left horizontally on the meat, with the heat of the grill still radiating off. Though I was happily enjoying a gluten-free hot dog, my friend who ordered the hamburger stated the burger didn’t make top 5 as it was a little undercooked. I can respect that, and would think this isn’t a common occurrence. Overall, for me the best part was that I could order french fries, and not just any type, but CHEESE fries (which is why the main picture is cheese fries). They stated the fryer was a dedicated for french fries to prevent cross contamination. I would suggest to ask this when you go to make sure this procedure is still in place. So this may seem quite simple. Hog dog – check. Fries – check. Drink – check. What made this place stand out was the service. Once I mentioned the hot dog was to have no bun the cashier immediately asked if it was gluten-free. I was quite surprised. After reading other reviews I found out one of the managers has celiac disease, and they take the necessary precautions to avoid cross contamination. So if you plan to eat at the Shake Shack anytime soon know that you can have a perfectly grilled hot dog, french fries and no gluten. Posted in Restaurants and tagged cheese fries, gluten free french fries, gluten free hot dog, Restaurants. Bookmark the permalink. Previously I did a ‘Back to Basics’ post to help those learn how to get started on a gluten-free diet. Now is your chance to see how much you remembered! 1. Which of the following is considered a ‘safe’ grain? 2. Which of the following is not considered a ‘safe’ grain? 3. Do all gluten-free products state ‘gluten-free’ on the package? 4. Are Oats safe to eat? If you would like to read up on the above topics go here to my previous post regarding this information. Posted in Living Gluten Free and tagged celiac diagnosis, gluten free diet, Gluten-free foods, gluten-free grains. Bookmark the permalink. I sometimes forget the initial feeling I had when I was first diagnosed as being celiac and having to start my new life on a gluten-free diet. The beginning is not easy by any means. You go through many different emotions, and for me my first one was happiness. Yes, HAPPINESS! I was so happy to finally know what was wrong, that the way I felt was not normal, and there was a solution. Immediately after my realization that there was an issue, I did go through the emotions of ‘How is my life going to change?’ and “Can I live like this?’, and many others that posed concern for daily living. As a back-up procedure don’t be afraid to call the company directly. When shopping you can call the customer service number listed on the package to discuss with the company any gluten concerns you may have. Sauces and dressings are main areas for hidden gluten. For example, soy sauce has wheat in it, but there are non-wheat variations like San-J. Given that salad dressings and seasonings harbor hidden gluten, grocery shopping is being made easier by the day, thanks to stores like Giant & Wegmans, who utilize a “G” or some other gluten free symbol. In addition, as celiac disease and the gluten-free diet increase in popularity and gain publicity, gluten-free products are continually expanding both in terms of product and shelf space. Some products can be found in the ‘organic’ section (don’t confuse gluten-free with organic, they are different), whereas others are on the same shelf as their wheat version (think Betty Crocker and their cake mixes). Always Read Labels. You must still read labels and I say this for two reasons. First, a product may be gluten-free but does not have a symbol. Second, a product may not be gluten free but the ingredient list doesn’t highlight gluten in the ingredients. Examples: Bubba burgers are gluten free but their packaging does not have a gluten-free symbol. Rice Krispies are not gluten free but the ingredient list doesn’t highlight the use of malt (unless you purchase the gluten-free Rice Krispies). Posted in Living Gluten Free and tagged Celiac, celiac diagnosis, Diagnosis, gluten free diet, gluten-free ingredients, gluten-free lifestyle, living gluten-free, Shopping gluten-free. Bookmark the permalink. 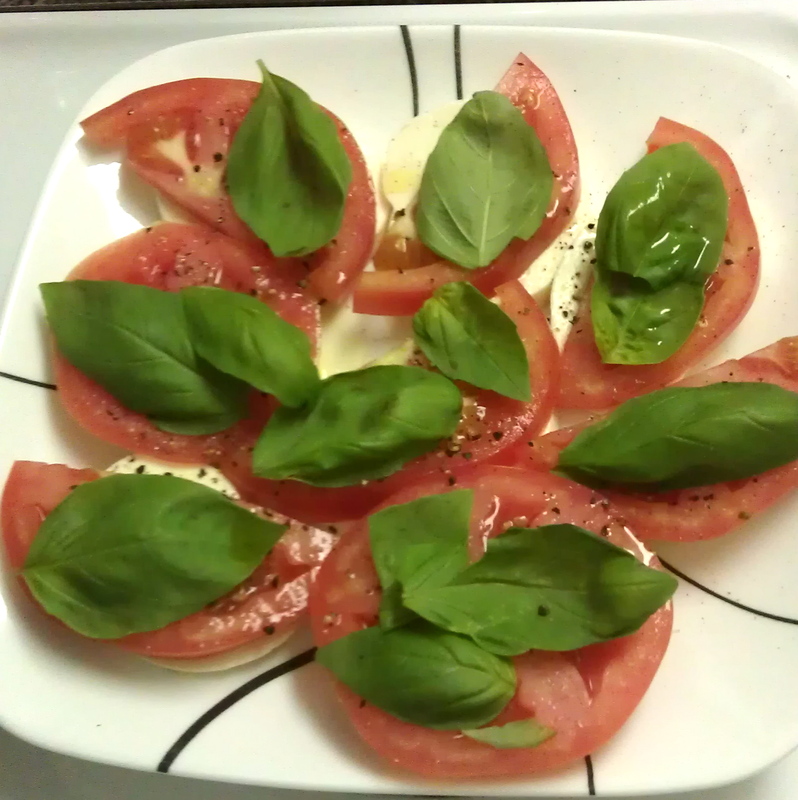 Posted in In the Kitchen and tagged Basil, Caprese Salad, dinner, Gluten-Free Appetizer, Italian Appetizer, Mozzarella, tomato garden, Tomatoes. Bookmark the permalink. Another Gluten-Free Chex Added to the Family! 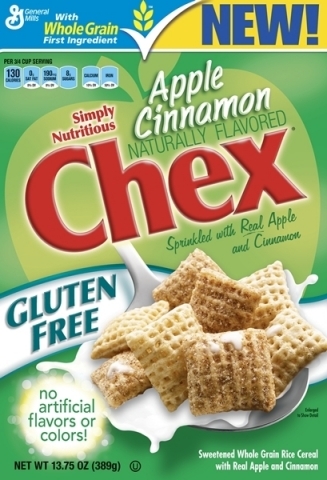 RecentlyGeneral Mills introduced another gluten-free Chex – Apple Cinnamon. I am an avid Chex eater and this news is quite exciting; it’s great to have another option available . There are 6 gluten-free cereals to choose from, and who says you can only have this at breakfast? I find a bowl of cereal is a great snack whenever you need a sweet treat or something quick to eat. Click here to read more. Posted in In the News and tagged apple cinnamon chex, breakfast, Cereal, chex, food, general mills, gluten free chex, snack. Bookmark the permalink. The term “pound cake” brings to mind a sweet, hearty, and rich cake. Best served with a glass of milk in my opinion, but I know others who prefer it with a cup of tea or coffee. My pre-celiac years recall sharing this dessert with my grandfather who always had a treat reserved for any given day. Sometimes homemade, sometimes store-bought, but always scrumptious. I have never attempted to bake a pound cake, neither gluten-free nor the gluten-laden version. Thankfully I don’t have to either. Thanks again to Jennie’s Gluten-Free Bakery, they have now introduced to the celiac community a satisfying treat worth trying. A great selling point I would like to highlight is the packaging. Each box contains five individually wrapped single mini-cakes. Perfect for one and ready for travel. These cakes aren’t in stores just yet so please visit the site to shop online and try some. I think it’s wonderful that companies such as Jennie’s strive to introduce new products to the gluten-free community. To me it’s exciting to see companies expand their product lines to encompass individual wants while still making sure celiac needs are met (no cross contamination here!). In time I hope to find these on store shelves along with their macaroons. Posted in Products and tagged Cake, Dessert, Gluten-Free cake, Gluten-free dessert, mini cakes, Pound Cake, Store bought cake. Bookmark the permalink.